It’s been a fairly uneventful week and this is one of those times when uneventful is good! Dudley has been his usual charming self, behaving during the middle of the night and still no more accidents. I finally caved and bought him a new set of dishes in an elevated stand. 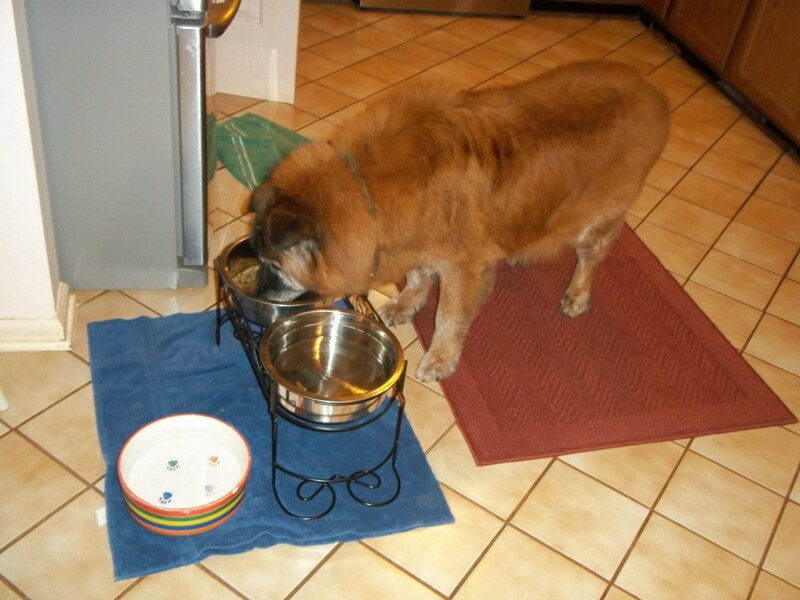 I don’t think Dudley had a difficult time dipping down to eat or drink water, but seeing how much easier it is for him with the elevated dishes, I could kick myself for not buying it a few years ago. I could also kick myself for not buying it at Sears, as it was considerably cheaper than where I did buy it. I’ve always used stainless steel bowls for food and ceramic bowls for water. I am seeing more and more reports of dogs and cats that develop skin conditions from eating and drinking out of plastic containers. Stainless steel and even ceramic are more resistant to bacteria than plastic, and both are more durable and last longer. Squidoo has a great article about the safety of different materials used to make pet bowls. It also has a video of a dog drinking water in slow motion that is way cool and just might surprise you when you see how dogs really do drink water. Check it out. Also, clean your pet’s dishes frequently. I don’t do it every day, but I do clean them 3-4 time each week and at least once a week, I add a little bleach to the dish water. Bleach will kill any bacteria that may accumulate and it cuts the “slickness” from your dog’s saliva that plain dish soap doesn’t always eliminate. I’ve never given my dogs bones from meat that I eat or fed them from the table. That’s not to say my dogs have never gotten into the trash or absconded with “people food” from the counter and every now and then I will put a little bit of meat into their dish, not to mention carrots are the snack of choice. 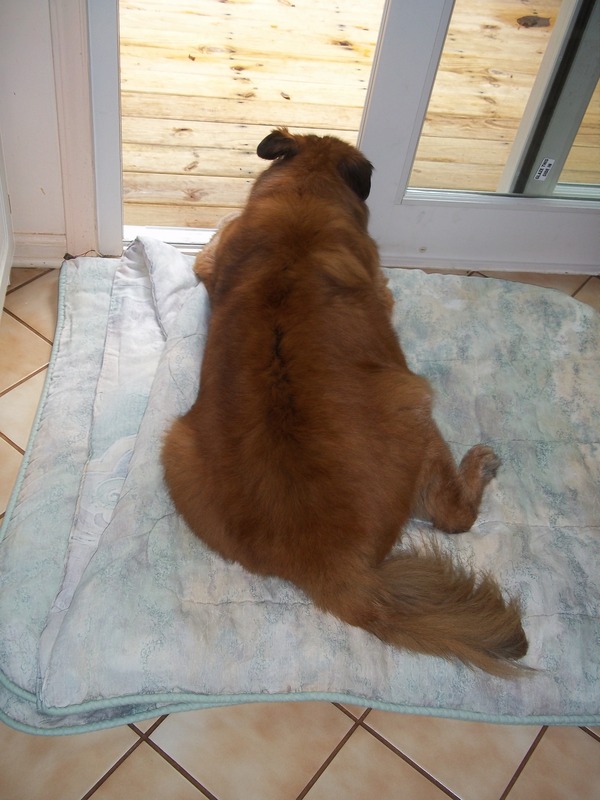 If your dog has an upset tummy, the vet will often advise feeding them rice and chicken broth and if your dog needs to lose weight, green beans will help a dog feel full longer. So there are some foods that humans and canines can share. There are also some foods that humans eat that dogs should NEVER eat: chocolate, grapes, raisins, avocados, onions, garlic (this includes onion powder and garlic powder), nuts and “sugarless” products that contain xylitol are just some foods to keep away from your dog. Web MD has a terrific slide show that details many other foods that dogs shouldn’t eat. Keep your dogs healthy and make sure they eat only what is good for them. This entry was posted in Uncategorized and tagged animals, canine, dog dishes, dog food, dogs, Dudley, elevated dog dish stand, Squidoo, Web MD. Bookmark the permalink.